Logistical complexities in horizontal resource plays are stretching the upstream supply chain to new limits to fit the scale of field operations that consume vast quantities of pipe, proppant, chemicals and other goods around the clock. History teaches that it was a simple logistics failure–not the harsh Russian winter nor brilliant military tactics–that really brought Napoleon to his knees in 1812. It was a lesson for the ages in supply chain management, demonstrating what can happen when the pace and scope of frontline operations outrun the logistical framework supporting them. Oil and gas companies certainly can relate to Napoleon’s dilemma. Horizontal rigs are drilling farther and faster, achieving daily penetration rates of a mile or more. Fracturing fleets move just as quickly, with even high-intensity stimulation designs placing treatments at the clip of one stage every hour. Logistics, truly, are half the battle in tight oil and shale gas plays, and safely getting equipment and materials to location on time to keep up with pad operations that are moving faster and consuming more is the stuff that keeps logistics managers awake at night. No one wants to find himself waving a white flag because field operations overwhelmed the supply lines that were supposed to be backing them up. The numbers tell the story. In the Permian Basin, for example, Rystad Energy estimates the lateral lengths of wells drilled in the first quarter of 2017 were 1,600 feet (22 percent) longer, on average, than wells drilled in first-quarter 2014. Yet, the U.S. Energy Information Administration forecasts that new Delaware Basin horizontals will take five fewer rig days to drill in 2018 than they did in 2014, while Midland Basin wells are expected to slice two days off 2014’s average drill times. Looking at well completions, the average number of frac stages effectively has doubled since 2014, and Rystad Energy calculates the amount of proppant pumped per Permian horizontal well has jumped from 6.3 million to 14.5 million pounds (with a corresponding increase in proppant intensity to 1,900 pounds per lateral foot while fluid intensity has reached 52 barrels per lateral foot) over the past three years. EIA says proppant and fluid volumes will dial up again in 2018, estimating that each Midland Basin well completed will consume 200,000 more pounds of proppant than those completed in 2017, while Delaware Basin wells will pump 500,000 more gallons of fluid compared with wells completed this year. Real-time completion analysis for quality assurance and quality control is key to maximizing productivity and recovery rates in tight oil and shale gas plays. Using pressure measurements as the primary input data, real-time analysis allows completion engineering to be optimized on site during treatment to improve stimulation effectiveness all along the lateral. So how are operators managing to keep the logistics network connected and in sync? Depending on the company, Poulson says the preferred approach to “feeding the beast” ranges from outsourcing 100 percent of logistics to third-party specialists to assuming primary responsibility for virtually all well site logistics, including self-sourcing proppants and chemicals. The first stop on the oil and gas logistics train is the first step in the value creation process: drilling. Ed Pilcher, drilling superintendent at Integrated Petroleum Technology, says the trick is in getting services and materials to site on time, but without overlapping. That is especially true in the Niobrara/Codell in the Denver-Julesburg Basin, where small-footprint pads are encircled by sound walls, light barriers and other measures to minimize disturbances. 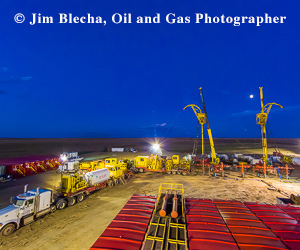 Batch techniques have paid huge dividends in enhancing drilling efficiency in resource plays, but Pilcher points out that they also help streamline drilling logistics by repeating operations using common fluid systems, cements, pipe, downhole tools, etc. “In the D-J Basin, we estimate that batch drilling techniques save 20 percent of the cost of each well. If you batch drill five wells, the sixth one on a pad is basically free,” he notes. That includes logistics. To eliminate operational issues and supply chain choke points, Pilcher says IPT encourages operators to conduct detailed prespud meetings with all parties involved in a drilling operation on the first well on a pad, going through the well plan step by step. The newest generation of transload facilities are designed to have the flexibility to accommodate large orders on short notice, with the proppant selection, storage volume and delivery mechanisms to allow just-in-time inventory management to quickly react to unplanned changes in treatment designs. Built-in quality control measures such as scannable rail car tags and SCADA system lockouts prevent cross-contamination of different proppant types and gain sizes. The mantra “more is better” has come to define the completion operation–more stages, more proppant, more fluid, more horsepower, etc. With pad frac operations occurring concurrently, the combination of larger job sizes and simultaneous workflows is putting even greater stress on what already was the most daunting aspect of managing oil and gas logistics, according to Poulson. “It is just getting more and more complicated,” he observes. Real-time optimization means different things to different disciplines. In drilling, real-time analysis may be geosteering to keep the BHA in the target zone. But, Pilcher points out, the types of adjustments made to the drilling plan while the bit is turning–i.e., changing inclination or adding mud weight–usually have little immediate impact on the logistics network supporting a field campaign. According to Poulson, small companies tend to be the most enthusiastic adopters of real-time completion analysis. “These companies cannot afford subpar wells. They are buying small leaseholds and using the best completion engineering they can get their hands on to get the most from each well they invest in. Utilizing consulting specialists gets the smaller companies the best engineering without having the overhead of large staffs,” he states. The ability to diagnose and tailor stimulation treatments on the fly is pushing proppant supply to become more responsive with a delivery infrastructure capable of functioning on a just-in-time inventory management basis, observes Jeff Bartlam, president and co-founder of Shale Support in Picayune, Ms. This real-time, on-demand requirement is reflected in the design of a new generation of transload facilities, such as Shale Support’s 300-acre center under construction in the Permian Basin. With a double-loop track and 40,000 tons of storage, Bartlam says, the facility is designed to have the flexibility to accommodate large orders on short notice. By originating proppant in or near resource plays, regional sand mines enable faster and more responsive logistics, and ultimately, reduce proppant cost. With the U.S. Energy Information Administration estimating that proppant will account for 15 percent of an average Midland Basin well’s total cost in 2018, a lower-cost proppant supply chain can have a material impact on pad economics. The more tightly linked the communication along the supply chain, and the more storage that exists in proximity to the well, the better suppliers can react to unplanned changes to treatment designs, he emphasizes, adding that visibility works both ways. Quality control concerns go along with increasing volumes of different grades and types of proppant moving through transload facilities, raising the risk of cross-contamination, Bartlam says. He says Shale Support attaches fabric tags with scannable barcodes to each rail car to identify the proppant type, mesh size, date of origination, etc. He adds that the supervisory control and data acquisition systems at the company’s transload facilities have lockouts so that when a rail car’s tag is scanned during unloading, proppant is automatically prevented from entering a silo containing a different type or size to eliminate contamination. However, moving storage closer to the well site adds another proppant handling point, creating more ambient dust and potentially reducing sand cleanliness. “We have integrated a new program with a supplier to provide turbidity testing in addition to sieve analysis for each rail car so the customer can know not only the sand’s quality and grain size, but also its cleanliness,” he concludes. Silica dust is subject to one of two new federal regulations that soon will weigh on the logistics supporting hydraulic fracturing, reports Taylor Robinson, president of Oak Park, Il.-headquartered PLG Consulting, which works with producers, pressure pumpers, sand companies and transload operators to improve proppant supply chain management. In December, commercial truck drivers must begin complying with the U.S. Department of Transportation’s electronic logging device rule, which imposes electronic records tracking of service hours and duty status. In June, U.S. Occupational Safety & Health Administration rules take effect that set exposure limits for respirable silica dust and require employers to minimize worker access to high-exposure areas. Although pressure pumping companies generally have assumed responsibility for well site proppant delivery, Taylor points out that a growing number of operators have decided to self-source proppants and chemicals. “Self-sourcing means they take ownership of the last-mile logistics, which is challenging,” he notes. The ability to unload faster and store more volume on site aligns with the demands being placed on transload facilities to accommodate short-notice design changes, Taylor notes. “Portable silos typically hold a day to a day-and-a-half worth of proppant, so it provides a buffer if changes need to be made on the fly,” he reasons. The result is a leaner, lower-cost proppant supply chain that can have a material impact on completion costs, Taylor suggests. EIA estimates that proppant will, on average, account for 15 percent of a Midland Basin well’s total cost in 2018. For comparison, EIA projects that drilling operations and casing each will account for 10 percent of well cost. “In wells with high proppant intensities, proppant actually can be up to 25 percent of the total well cost. If the total delivered cost of sand can be cut by 40 to 50 percent, there is an opportunity to save a significant portion of the well completion cost,” he summarizes.